This is the best high protein smoothie bowl recipe that I’ve ever made because it is a complete meal replacement and tastes absolutely delicious. 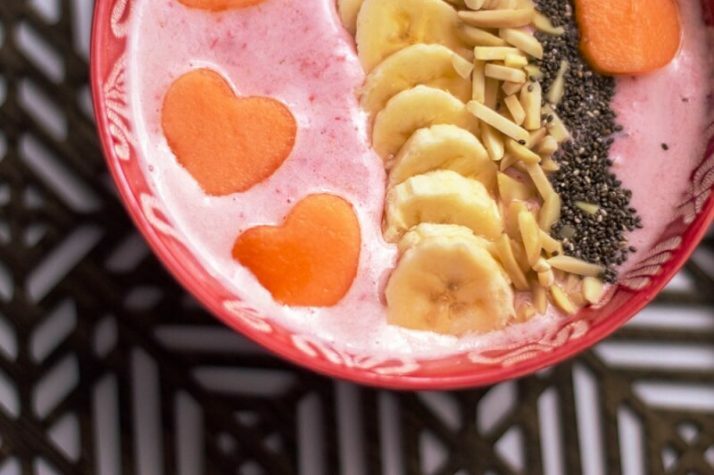 You can replace your breakfast or lunch with this smoothie bowl, get enough protein and other nutrients for good health and be completely full until your next meal. I am a busy person with no time for snacking, so I drink a lot of healthy homemade meal replacement protein shakes which all contain extra natural sources of plant-based protein. 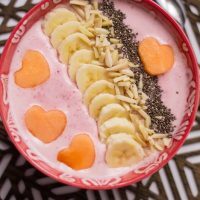 This fruity protein smoothie bowl is a great meal to make when you want to sit down with your family and have a proper meal that you are chewing and eating from a bowl rather than drinking on the go. 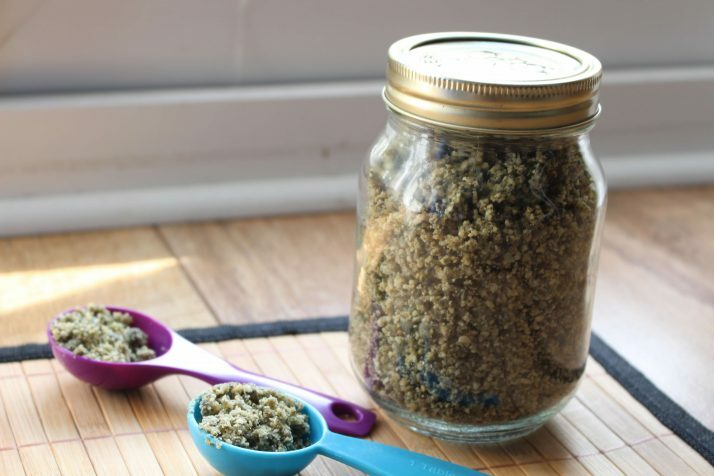 Plus the ingredients are so natural and healthy that you could also serve this to your kids for a fast meal replacement, and they will adore how cute it looks. My kids love the extra effort that I go to when I create a smoothie bowl for them. This recipe is vegan, gluten-free, natural and plant-based, refined sugar-free and is based on whole foods. What Is A Protein Smoothie Bowl? An excellent protein smoothie bowl begins with a thick mixture of whole foods, such as fruits, vegetables, and other ingredients. Whereas you can drink a smoothie with a straw, the smoothie bowl is a little thicker and almost has the consistency of ice cream. They aren’t intended to be gulped down. The smoothie bowl is meant to provide the sense of having a real meal, with layers of color, texture, and flavor. You eat it with a spoon and not a straw. Its thick texture makes it easy to add toppings, and they have the dense consistency to hold up to nourishing ingredients like granola and nuts, which not only provide crunchiness but also gives sustained energy, protein, and healthy fats to make sure you are full during the day. Some of the best smoothie bowls combine low glycemic fruits and plant-based fats, along with nutrient-rich green vegetables. Chia seeds, nuts, avocado, and hemp add creaminess and thickness to your bowl’s base. Those foods provide anti-inflammatory omega-3’s. Fruits like berries, apples, pears, apricots, and cherries add flavor and nutrients and promote stable blood glucose levels. A smoothie bowl is significantly larger than a cup, so you have a big serving size that can rack up calories quickly. Yes, they have healthy ingredients, but it’s important to keep the portions in check. A smoothie bowl can easily be more than 1,000 calories, which is more than half the daily recommended caloric intake for most women. Smoothie bowls can turn into high-calorie weight gainers very quickly if you aren’t conscientious. When you eat smoothie bowls, they can make you feel fuller. 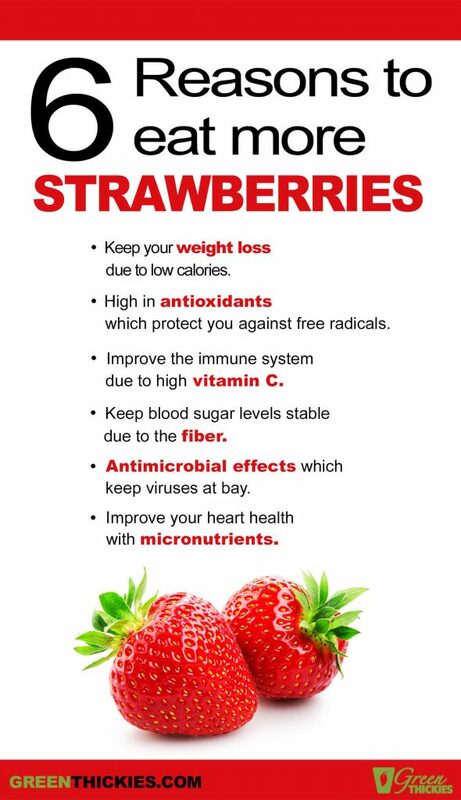 They help to stave off cravings and hunger. Now let’s move on to discussing the high protein smoothie bowl recipe that I am sharing with you today. How Much Protein Does This Protein Smoothie Bowl Contain? This recipe contains 16 grams of protein. Most of the protein comes from the almonds, chia seeds and soy milk. If you take away these 3 ingredients, you’ll be left with only 5 grams of protein in this smoothie bowl, so if you want to keep the protein high, you need to keep these natural healthy protein sources in this smoothie bowl. Should I Add Protein Powder To My Protein Smoothie Bowl? For many, protein powder is a simple, no-need-to-prep way to increase protein content for the day. If you want to add a powder to your smoothie bowl, it’s better to use a natural, plant-based protein powder. That means it’s sourced from legumes, nuts, grains, and seeds instead of animal products like meat, eggs, and dairy. Check out my 2 ingredient natural protein powder that you can make at home. Soy, peanut, rice, hemp, and pea are good examples of healthy protein powders. Did you know that soy is the only protein that has all of the nine essential amino acids? However, if you aren’t going to use a soy product, then an excellent alternative is a powder that combines sources such as rice and pea. But personally I don’t recommend that you use any protein powder in your smoothie bowl because you can get the same amount of protein from whole foods which contain all of the essential nutrients that you body needs in addition to the protein. 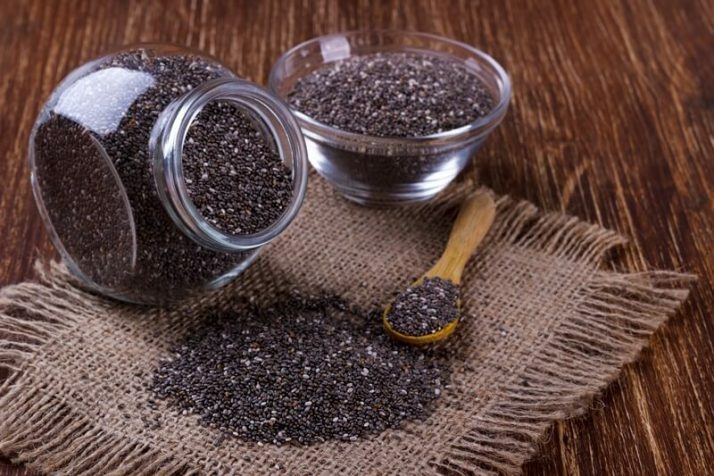 Chia seeds have a mild, nutty taste. Two tablespoons have 4 grams of protein. They also contain 9 grams of fat, 139 calories, 11 grams of fiber, 12 grams of carbohydrates and vitamins and minerals. According to the Nutrient Data Laboratory of the U.S. Department of Agriculture, a single almond has 0.25 grams of protein. That means, 10 almonds contains 2.5 grams. 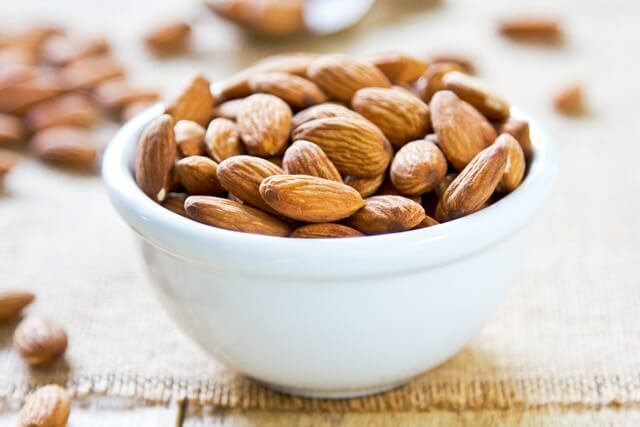 A single serving size of almonds is usually about 1 ounce. So, those whole almonds provide 5.75 grams of protein. 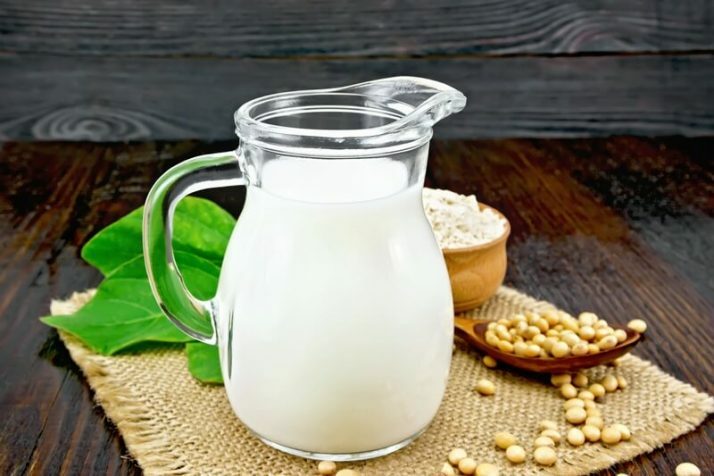 Soy milk has a complete plant-based protein. Eight ounces of soy milk provides 9 grams of protein and 5 grams of fat, which is less than in cow’s milk. There’s also no cholesterol or saturated fat. If you get calcium-fortified soy milk, in eight ounces, there are 7 grams of protein and 4 grams of fat. 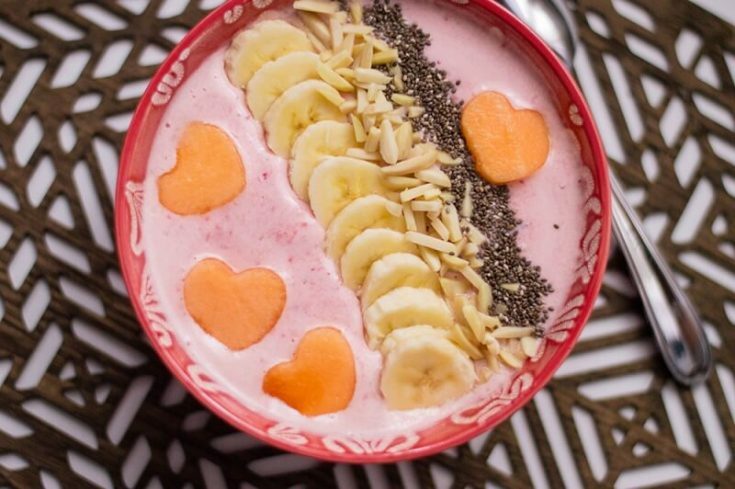 This smoothie bowl is less than 500 calories. It contains 16.6 grams of protein, with 70 percent of your daily dietary fiber.This recipe is rich with vitamin A, C, calcium, and iron. Add the strawberries, pineapple, milk, syrup, and 1.5 tablespoons or almonds and 1.5 tablespoons of chia to the blender. Using your cookie cutter, cut out hearts from your cantaloupe using a mini heart cookie cutter. Place carefully on top of your smoothie bowl. See all of my favorite essential healthy ingredients needed to make these recipes AND all of the best resources and products I can't live without by clicking here. If you’re into bodybuilding and you want to stick to a natural source of protein, then why not give my homemade protein powder recipe a try? It only contains 2 ingredients and all of the nutrients unlike protein powder where the nutrients are stripped away. If you loved this high protein smoothie bowl, then check out my other natural high protein shake recipes by clicking the complete guide below. I think you will love this smoothie bowl. It tastes great and makes for an excellent meal replacement when you have a bit more time to sit down and eat dinner at the table. I often eat smoothie bowls at the weekend when I’m with my family and I still like to make sure I get in enough protein and other nutrients. 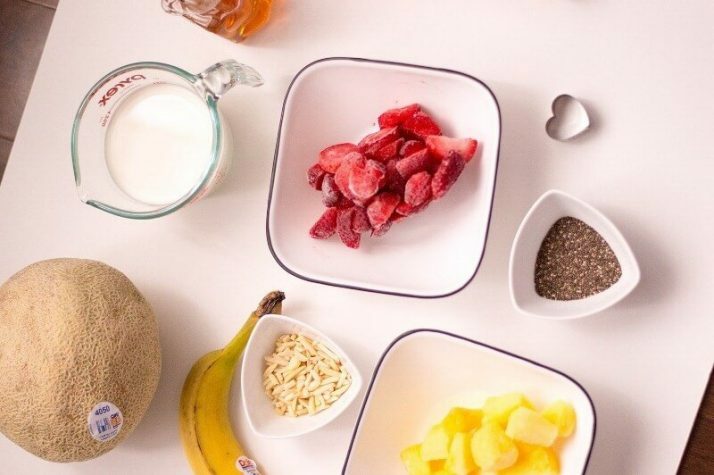 Plus, the smoothie bowl is made from natural, whole ingredients that your whole family will enjoy. 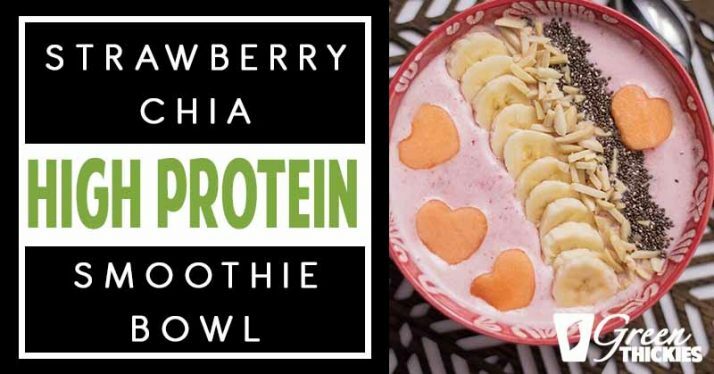 If you enjoyed this Strawberry Chia High Protein Smoothie Bowl, please let me know your thoughts in the comments.